Harnessing energy from the sun, which emits immensely powerful energy from the center of the solar system, is one of the key targets for achieving a sustainable energy supply. Light energy can be converted directly into electricity using electrical devices called solar cells. To date, most solar cells are made of silicon, a material that is very good at absorbing light. But silicon panels are expensive to produce. Scientists have been working on an alternative, made from perovskite structures. True perovskite, a mineral found in the earth, is composed of calcium, titanium and oxygen in a specific molecular arrangement. Materials with that same crystal structure are called perovskite structures. Perovskite structures work well as the light-harvesting active layer of a solar cell because they absorb light efficiently but are much cheaper than silicon. They can also be integrated into devices using relatively simple equipment. For instance, they can be dissolved in solvent and spray coated directly onto the substrate. Materials made from perovskite structures could potentially revolutionize solar cell devices, but they have a severe drawback: they are often very unstable, deteriorating on exposure to heat. This has hindered their commercial potential. The Energy Materials and Surface Sciences Unit at the Okinawa Institute of Science and Technology Graduate University (OIST), led by Prof. Yabing Qi, has developed devices using a new perovskite material that is stable, efficient and relatively cheap to produce, paving the way for their use in the solar cells of tomorrow. Their work was recently published in Advanced Energy Materials. Postdoctoral scholars Dr. Jia Liang and Dr. Zonghao Liu made major contributions to this work. This material has several key features. First, it is completely inorganic – an important shift, because organic components are usually not thermostable and degrade under heat. Since solar cells can get very hot in the sun, heat stability is crucial. By replacing the organic parts with inorganic materials, the researchers made the perovskite solar cells much more stable. "The solar cells are almost unchanged after exposure to light for 300 hours," says Dr. Zonghao Liu, an author on the paper. All-inorganic perovskite solar cells tend to have lower light absorption than organic-inorganic hybrids, however. This is where the second feature comes in: The OIST researchers doped their new cells with manganese in order to improve their performance. Manganese changes the crystal structure of the material, boosting its light harvesting capacity. "Just like when you add salt to a dish to change its flavor, when we add manganese, it changes the properties of the solar cell," says Liu. 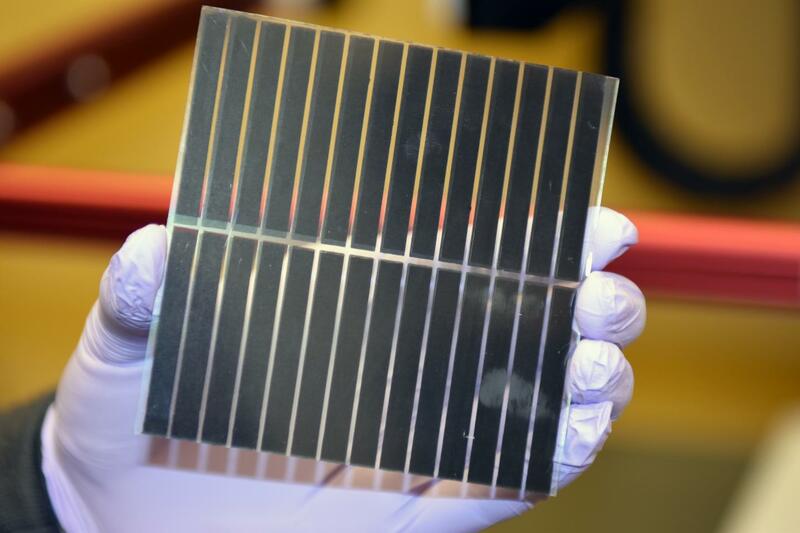 There are still a number of challenges to overcome before perovskite solar cells become as commercially viable as silicon solar cells. For example, while perovskite solar cells can last for one or two years, silicon solar cells can work for 20 years. Qi and his colleagues continue to work on these new cells' efficiency and durability, and are also developing the process of fabricating them on a commercial scale. Given how quickly the technology has developed since the first perovskite solar cell was reported in 2009, the future for these new cells looks bright.